Our rates are based on a 24 hour rental day, unless otherwise noted. Vehicles picked up on Saturday must be returned before 10:00 am on Sunday in order to receive the single-day rate. Half-day rates are not available during the weekend. Half-day rates (anything less than 4.5 hours) can be reserved no more than 24 hours in advance Monday – Friday. Email coasttruckrental@hotmail.com, with any questions. Insurance coverage is not included in any of our rates. 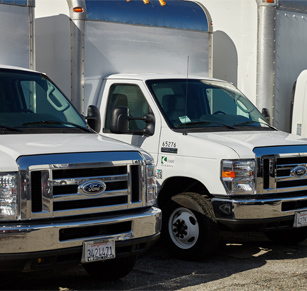 Coast Truck Rental is able to sell two levels of third party liability insurance and a collision waiver. RLI provides third party liability insurance that covers the minimum requirement set by the state. In California, the limits are 5/15/30 – $5000 property damage, $15000 single incident medical, $30000 total medical. The cost of RLI is $12.95/day for all sizes. SLI provides third party liability claims that exceed an existing policy, whether it be the RLI purchased through Coast, or a renter’s existing auto insurance policy. SLI covers claims above the limits of the existing policy up to one million dollars. For pickup trucks, cargo vans and 10 foot box trucks, the cost of SLI is $14.95/day. For 14 foot box trucks, 16 foot box trucks and stakebed trucks, the cost of SLI is $16.95/day. CDW covers new damage to the rental vehicle, with the exception of overhead damage or damage caused by unsecured loads. We sell a collision waiver with a $0 deductible as well as one with a $1000 deductible. For pickup trucks, cargo vans and 10 foot box trucks, the rate for the CDW is $18/day with a $0 deductible, and $14/day with a $1000 deductible.